Physical Metallurgy elucidates the microstructure, transformation and properties of metallic materials by means of solid state physics and chemical thermodynamics. Experimental methods of physical metallurgy are also treated. This third edition includes new sections on the permeation of hydrogen in metals, the Landau theory of martensitic transformation, and order hardening and plasticity of intermetallics. Numerous other sections have been brought up to date in the light of new developments (e.g. scanning tunnelling microscopy, CALPHAD-method, diffusion in glasses, DIGM, recrystallisation). New artwork and references have also been added. 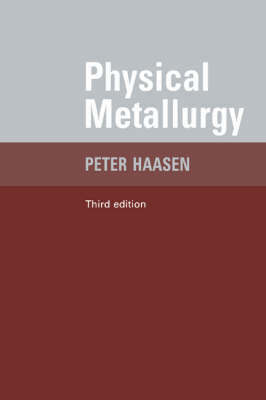 Professor Haasen's clear and concise coverage of a remarkably wide range of topics will appeal both to physics students at the threshold of their metallurgical careers, and to metallurgists who are interested in the physical foundation of their field.